Ducati has confirmed it will have a long list of famous racers confirmed for the 2018 World Ducati Week event in Italy which runs from July 20 to 22. 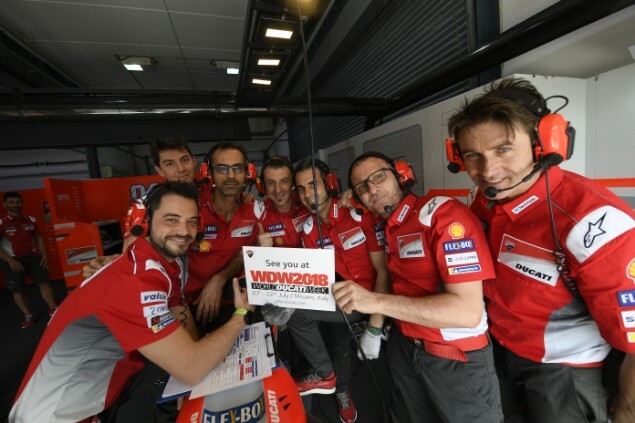 Named WDW2018, the event is hosted by the Italian motorcycle company and is the world’s largest Ducati gathering of fans – or Ducatisti – from across the world. The event is based at the Misano racing circuit on Italian Adriatic coast with a wide array of activities both on track and on road arranged. Confirmed to attend at the Ducati MotoGP team riders Andrea Dovizioso and Jorge Lorenzo along with the Aruba.it World Superbike team mates Chaz Davies and Marco Melandri. Other famous racers and former factory riders who have helped win world titles include Troy Bayliss, Casey Stoner and Carlos Checa. The Pramac Racing team of Danilo Petrucci and Jack Miller will be joined by fellow Ducati racers Tito Rabat, Xavier Simeon, Alvaro Bautista, Karel Abraham from MotoGP along with Xavi Fores and Lorenzo Zanetti from WSB. For those unaware of what WDW is all about, it’s an event hosted by Ducati every two years and allows close contact between Ducati staff (all the way up to the CEO), racers and new models. On Saturday evening there is a barbeque where Ducati staff serve food to the Ducatisti at the track. Usually, there are secret showings of new models to select crowds and it’s all held at Misano circuit which is on the beautiful Adriatic coast of Italy. The Ducati factory is only a couple of hours ride away in Bologna and there are loads of great riding roads in the area. There’s a huge variety of hotels and campsites in the nearby area which will suit all budgets. To book tickets go to wdw.ducati.com for more details.